The voice of research, how does Science → Policy? The need for evidence-based policy is widely recognised in the scientific and policy-making communities, and the importance of this in the IWT space is no different. It is especially important considering the often emotive nature of discussions around ‘illegal wildlife trade’, and the potential for ineffective or even counterproductive policies to be developed based on biased personal viewpoints and values, or often-uniformed public opinion. Within IWT policy-making there are some excellent examples of research contributing to an evidence base that informs policy at the national and international level. Take, for example, the Elephant Trade Information System (ETIS) and National Ivory Action Plan (NIAP) process, and the role of research in decisions around pangolin trade at CITES. However, these instances are more the exception than the rule. CITES still operates in a space where attention to different species is often driven by the priorities of individual countries and large NGOs. 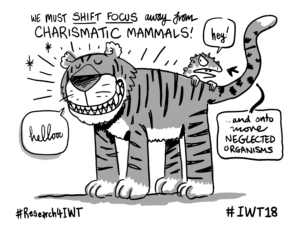 In the absence of systematic assessments of the threat IWT poses to different species, iconic and charismatic species tend to monopolise the debate. We firmly believe that evidence and research has a critical role to play in IWT policy. But, to use the language of an insightful opinion piece – what counts as evidence and how does evidence count? 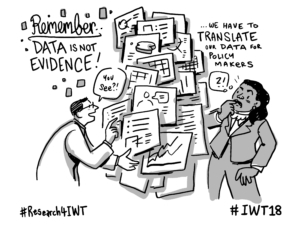 How did evidence count in shaping the policy messages and the declaration emanating from the 2018 London IWT Conference? Whose evidence counted? Just how much does scientific evidence really matter to policy makers? The London Conference made it clear to us, if it was not already, that scientists are just one (rather small) stakeholder group amongst many. In London, we heard the voices of business and finance, civil society, communities, even royalty and a few celebrities. Loud, clear and centre stage, but academic (or even merely scientific) voices were featured minimally. As a policy maker, how might you respond? As emphasized by Professor Ian Boyd in his plenary address at the preceding Evidence to Action event, the relationship between evidence and policy is complex and messy and so requires the right type of evidence that can be readily-used. He clearly pointed out that “data ≠ evidence”, but outputs from exercises such as horizon scanning can be very valuable. He also emphasised the critical point that interventions must be co-designed with end-users from the onset. As Bill Adams and Chris Sandbrook argue, science does not offer a “get out of politics free card”. It is wrong to think that poor policy decisions are simply an information deficit problem. If we could just do more research and communicate results effectively! This is to ignore the many other forces and stakeholders that influence decision-making independent of evidence. It is perhaps wiser to think of policy as being informed by, rather than based on, scientific evidence. Rather than thinking of ourselves as an independent and objective voice, we as researchers, should acknowledge our value positions and work with other stakeholders towards agreed goals. This is where we can be powerful agents for positive change, by using our evidence to help guide us on the path to achieve these goals. It’s ok if we let a little more than our own evidence count. Communities and orchids or celebrities and elephants? Who sets the agenda? Conservation action and discourse are inevitably political; those with power and influence tend to decide who benefits, and who loses out. Many discussions around IWT are firmly framed by the perspectives of those in Northern and Western countries. This can create homogenous approaches to IWT that simplify issues and rely on what has been done before to define future priorities, rather than recognising that policy responses and conservation interventions need to be as nuanced and diverse as IWT itself and the cultures within which it operates. For example, there has been (and continues to be) a tendency to refer to ‘Africa’ as one entity, but the continent hails 3000 distinct ethnic groups with up to 2000 languages spoken across 54 countries (that’s more than a quarter of the number in the world). These broader IWT policy trends were still apparent in the much-anticipated London Conference. Attendance at the event included several presidents and senior ministers, demonstrating high-level support. The Conference as a whole highlighted a perceived need for IWT to play a significant part of political and private sector agendas. Although several of the panel discussions and plenary addresses were informative, it was not clear how they were selected and who set the agenda. Consequently, some of the discussions excluded potential dissenting views on topics for which there remains no clear consensus. For example, a view from the private sector that conflated illegal wildlife trade with sustainable legal trophy hunting that actually benefits conservation went unchallenged. In a few keynote addresses and panel sessions, we heard IWT being used alongside terms such as evil or disgusting. In some instances this framing discounts the social and economic realities of IWT, ignoring the fact that livelihoods can often be intertwined with IWT. Across Africa, there are evident contrasting views on the sustainable use of resources as a means of addressing IWT, with values expressed by Botswana and Namibia conflicting with stances taken in Kenya. The London Conference also exhibited the clear contemporary shift from state-led initiatives to inclusive modern governance, in which civil society has an active voice. Collaboration between governments and private sector was clearly evident, highlighting the interests of certain players in the transport, information technology and finance sectors. While such engagement is certainly welcome and necessary, the interests of those sectors do not always align closely with socially inclusive conservation objectives, nor do they necessarily engage with evidence-based policy (as opposed to marketing goals). Yet these actors have the power to push their agendas regardless. The Conference demonstrated an increased willingness to engage with local communities as critical stakeholders, providing a platform for community voices to be heard. However, the extent of this engagement appeared to lean more closely toward communities that accept a Western-dominated view of conservation: one that prefers approaches based on protected areas and wildlife tourism over any forms of consumptive wildlife utilisation, even that which is legal, sustainable and ultimately supportive of landscape conservation goals. Tokenism around community voices is a more general, but key, problem in IWT discourse and policy. The ‘community involvement’ mantra often results in hollow attempts, with community voices present, but shunted to the side. Greater effort is required to genuinely integrate community voices in to IWT policy and discourse such that they are listened to, heard and form part of the decision-making process. Also, iconic megafauna, i.e. elephants and rhinos are too often the focus of IWT discussions and this event was no different in this respect. The Conference was an excellent opportunity to diversify the dialogue to other less recognised and neglected groups that are subject to illegal trade including cacti, orchids, myriad birds, reptiles, amphibians and marine fishes. Orchids for example, make up >70% of the CITES Appendices, but their widespread illegal trade wasn’t highlighted or discussed. Despite widespread recognition of the need for IWT policy to be more strongly informed by evidence, it is clear we have a long way to go. Policy formulation and implementation is shaped by competing voices and values at individual, organisational and national levels. This highlights not only the need for evidence-based policy, but also for context-specific policy. 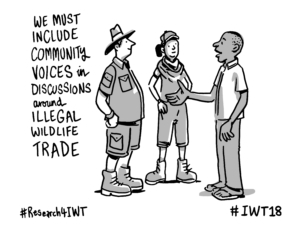 More broadly, there is a need to identify strategies for giving less-powerful players (communities, non-charismatic species, and science) a more valued voice in global IWT policy. Realistically, this must involve more influential players acting on behalf of those who don’t have the same privileged access to resources and platforms for amplifying their voice. Everyone has a part to play, and even we, as researchers at an institution with comparatively more influence, share this responsibility. Read the Evidence to Action briefing note on how research can be used to address the illegal wildlife trade.